NOTD: OPI "Suzi & the 7 Dusseldorfs" and Leighton Denny "Angel Dust"
Ive been doing alot of Indie polishes recently so thought id take a step back into the mainstream to remind us that great polishes do exist outside the Indies! Ive been getting along with OPI polishes alot more than normal recently, have discovered alot of colours that i really do love and forgot about them (shame on me). Today's NOTD started off as just being OPI's "Suzi & the 7 Dusseldorfs" (yeah, i think you can tell what inspired that name really!) This is from The 2012 Germany Collection, and personally i think this is the best one of the 12 collection. Described as a "red violet", its a gorgeous plum purple with almost like a gloss coat built in to it! Its gorgeous! The Leighton Denny is a bit more expensive from what i can find. The link in the picture shows you it from Look Fantastic for £11, but I'm sure if you had a looksie around it should be able to be picked up cheaper! 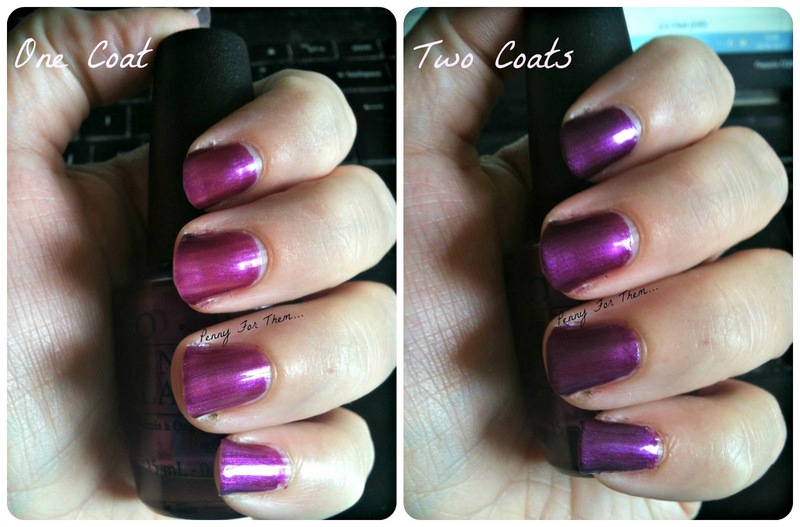 It only took 2 medium-thick coats to get full opaqueness which I was very happy with! Went on like a dream, and you can see it really does have a glossy look already, without a top coat! Love this polish! It looks yummy on its own right? But I thought I'd add a new addition from my collection- Leighton Denny's "Angel Dust" which is basically a clear polish with tiny little sparkles if glitter. I mean TINY!! I wanted a little bit more than what one cost gave me so it took 3 thin coats to get the right sparkle I wanted. Looking back maybe using something like China Glaze's "Lux and Lush" with the slightly bigger pieces of glitter might have been easier but like I say I wanted to try this one out and I'm pleased with the way it sparkles oh do subtlety when any kind if light catches it. Yes I love my Indie polishes and I think that's well known, but sometimes I need a reminder that I have mainstream polishes that some are just as lovely and I need to really add those in my blog, especially for those who either aren't too keen on the indie polishes or just can't get hold if them. This is a really beautiful polish. Not too dark, a gorgeous colour, easy to use and very hard wearing! Are there any Opi polishes you love and would recommend? My collection of Opi's are actually growing as I discover more and more yummy colours- but at the same time trying not to dupe any colours I already have!! When you have as many as me, trust me it can be a task!! Nice shade, but I do not like this type of nail polishes..
im sad to read this! What is it you dont like about it? This looks lovely with the glitter over it! I love OPI, but I don't think I could pick a favourite! Adds a little glitteroony to it doesnt it!! Ive opened my eyes a bit with OPI and agree there are so many nice colours! !